This week, with Spring holidays just about to begin and many Australian’s heading away on holidays, it seemed a perfect time to share the amazing image above. Many Australian’s may be seeking out the last of the winter snows, but others will be taking advantage of the start of the warmer weather, heading for the beach and in search of sun, surf and sand. Although there are many locations along the coast perfect for searching out this iconic part of Australian summers, Newcastle not only has the famous triad, it is actually surrounded by it. Newcastle, one of the major cities of NSW, is a seaside city abundant in sun, surf and sand. In fact, the city centre is surrounded by no less than 8 beaches! The image above appears to show Newcastle Beach itself, though the beach is not specifically identified. With such an abundance of sand and surf it is perhaps no surprise that Newcastle has an historic beach culture dating back well over a century. Even in the convict era, Commandant Morisset wanted to enjoy the sea, ordering the convicts to carve a sea bath (now known as The Bogey Hole) from solid rock! In the 20th century, the iconic Newcastle Ocean Baths which even today are famous for their art deco pavilion, were built. Although they were not officially opened until the 1920s, records suggest these art deco baths were unofficially used as early as 1912. 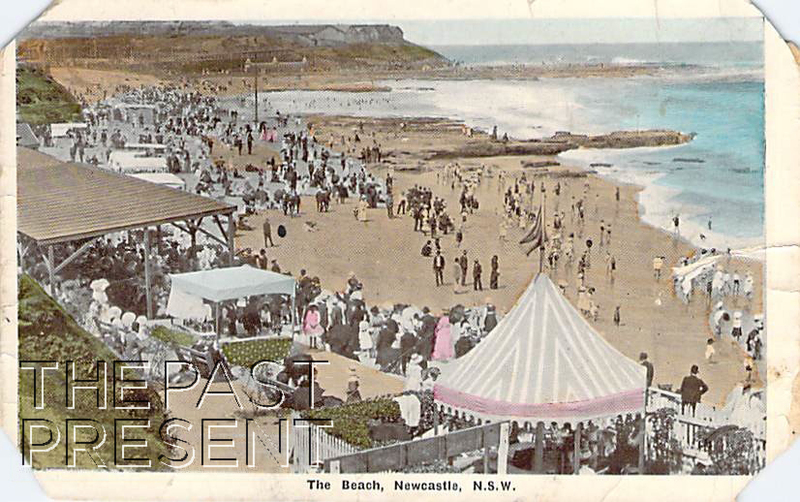 Yet despite the ocean baths available, many people wanted to enjoy the beach itself, and with so many to offer, Newcastle soon had a thriving beach culture focussed on the many spectacular beaches. As the image above shows though, swimming was not the only pastime enjoyed at the beach – many came to see and be seen and long dresses and full suits were a common sight. This week, with the Summer holidays in Australia well underway, many Australians will be going away, often in search of sun, surf and sand. Although there are many locations along the coast perfect for searching out this iconic part of Australian summers, Newcastle not only has the famous triad, it is actually surrounded by it. Newcastles city centre is surrounded by no less than 8 beaches, and it is thought that this image shows Newcastle Beach itself. Newcastle, with its abundance of sand and surf also, perhaps unsurprisingly, has a history of beach culture dating back well over a century. Even in the convict era, an historic ocean bath, the Bogey Hole was carved from the rock to allow Commandant Morisset to enjoy the sea. In the 20th century, the famous Newcastle Ocean Baths with their stunning art deco pavilion, were built and records suggest the baths were unofficially used as early as 1912, a whole decade before they were officially opened. Yet many wanted to enjoy the beach itself, and a thriving beach culture grew up around the many spectacular beaches. As the image above shows though, swimming was not the only pastime enjoyed at the beach – many came to see and be seen and long dresses and full suits were a common sight. The image above is a stark and I think artistic view of a trade which was once central to Newcastle and the area. Although now gone from the area, BHP once employed vast numbers of Newcastle residents, and supplied still more who worked in the mines supplying raw product, with jobs. 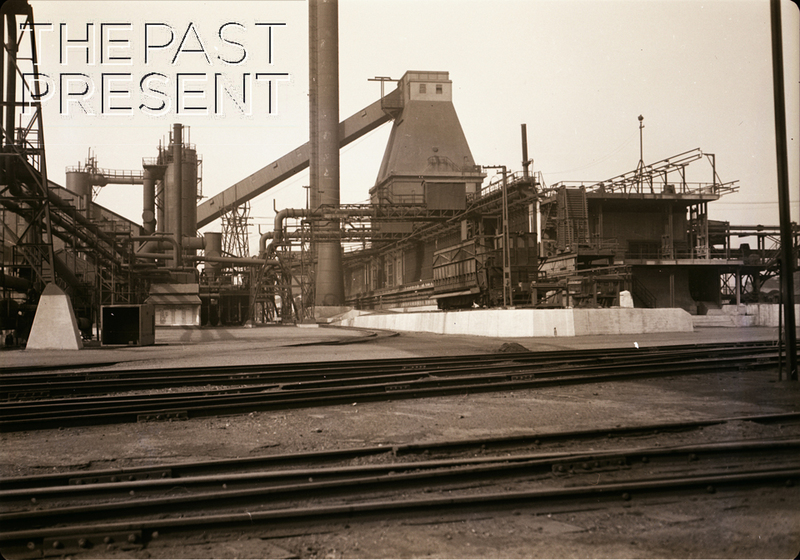 In the early 1900s Australia was demanding more and more steel and in 1911 BHP (Broken Hill Propriety LTD) decided to step in and begin to manufacture the precious resource. They decided Newcastle would be the perfect place to build their steelworks as there was a harbour which could be used for transport, a ready workforce, and they already owned land in the area. The steelworks opened in 1915. In order smelt iron and make steel, another product was needed though – coke. To smelt iron the iron ore has to be reduced and to do this, you need carbon. Burning carbon creates carbon monoxide which reacts with the iron ore. Combine this with high heat and the iron melts and can be drained off. Coking coal is a fuel with very few impurities and an extremely high carbon content which is made from coal and widely used in the steel industry. BHP in Newcastle made its own coke on site. To do this, they needed coke ovens which could heat the coking coal to very high temperatures, driving off impurities and leaving behind coke. This could then be either stored or transferred directly to the blast furnaces. This week, with many people gearing up for the Easter break and possibly finishing up work for a day or two, The Past Present is sharing the beautiful image above, from the collection of an unknown photographer and taken in 1936. The photo is a rarity in the collection, a work without a negative or description, but it is such an evocative glimpse into the past. 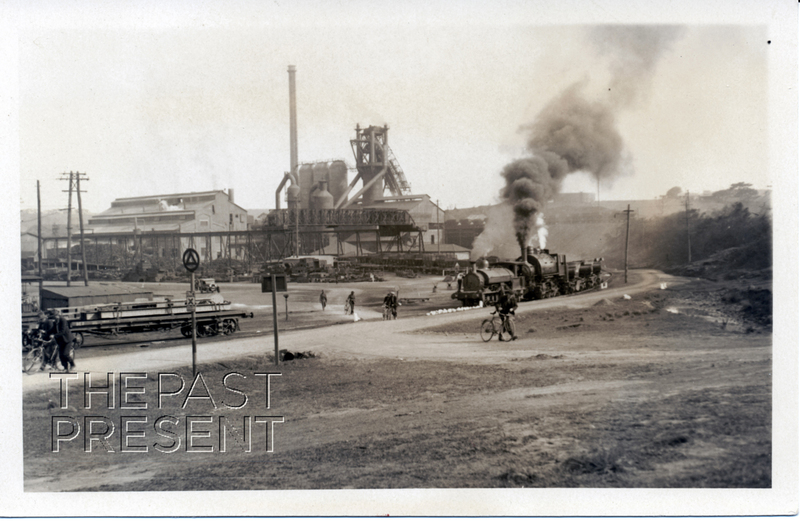 The photo is believed to show BHP Steelworks in Newcastle (a location which features heavily in the collection), but the aspect of the photo which I find most intriguing is the number of bicycles being ridden away from the factory. It appears to be the end of the day and the workers have mounted up and are heading home on their two wheeled transport. Several sources I have been able to find suggest that bicycles were a popular mode of transport for workers at the steelworks with hundreds of bicycles making the journey on a daily basis. There is a certain relaxed, country air to the scene for such a busy steelworks! The extraordinary photo above, dating from circa 1936, is one of many in the Past Present collection focussing on Newcastle in NSW. It provides a glimpse not only into the history of Newcastle, but the history of Australia during the Great Depression, showing one of the depression settlements which sprung up not only in Newcastle, but in other cities, including Sydney. 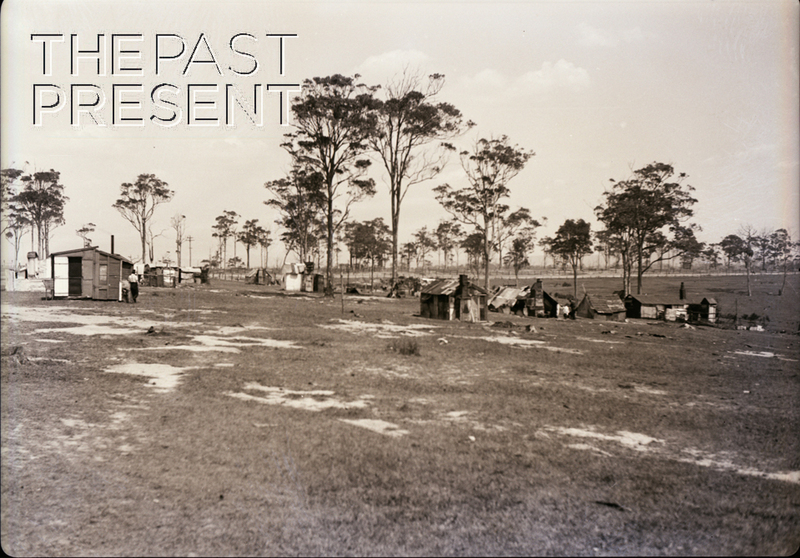 During the Great Depression, many Australians lost their only sources of income and were forced from their homes. Many took to the road looking for work, while others moved into camps like the one pictured. Whole families took up residence in these camps, often arriving only with the possessions they could carry, and starting from scratch. They would choose an empty area and erect a rough shack, using whatever materials they could access, including wood, corrugated iron and even hessian sacks. In Newcastle, many sought jobs at the various factories, but work was hard to come by. Unemployment in Newcastle was high, estimated at 30% of the working population, and many moved into the shanty towns which sprung up at Nobby’s Beach, Stockton, Carrington, Adamstown, Lambton, Waratah and Hexham. Life in the camps was hard, but there is evidence in this photo which also shows the normality of life – a man is being shaved and children play between the shacks.